Apartments Mirjana are situated in the residential part of Novigrad on the west cost of Istria, Croatia, only 300m away form the beach. 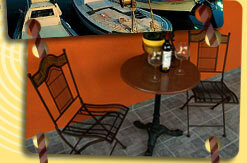 The house has 3 high-quality built and furnished apartments. One of them have a view of the sea. For all our guests, in front of the house there are parking place. The apartments have got 3 stars! The house has a garden where your children can play safely. Distance: sea 400m, restaurant 50, shop 50m, center 700m.